See Kuala Lumpur as never before…! new perspective to the dynamic city of Kuala Lumpur. 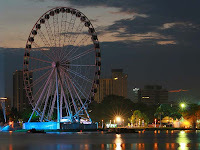 “Eye on Malaysia” is the largest portable wheel in the world, and the first overhanging a lake. The “Eye on Malaysia” provides stunning views across Lake Titiwangsa, all the way to the world renowned Petronas Towers and KL Tower.This astounding viewing wheel consists of 42 fully air-conditioned gondolas, 39 of which have the capacity to carry a cosy eight passengers per 12-minute ride.